The Pullo Center at Penn State York welcomes The Princess Bride: An Inconceivable Evening with Cary Elwes to its stage on Thursday, April 30, 2015, at 7:30 p.m. Ticket prices are $98 VIP and $39, and go on sale March 2 at 10:00 a.m. Members can order now. Tickets can be purchased at The Pullo Center Box Office, charge by phone at 717-505-8900, or online at ThePulloCenter.com. In this highly-anticipated event, fans of The Princess Bride will join the heroic Westley (actor Cary Elwes) in a behind-the-scenes look at life on and off the set of the classic film. After a screening of the iconic film, Elwes will engage in a moderated discussion on classic scenes, revealing never before shared secrets and tales of inconceivable antics! Journey back to the lands of Florin and Guilder; filled with adventure, romance and intrigue (and let’s not forget Rodents of Unusual Size!). Cary Elwes has been seen in a multitude of films, including Robin Hood: Men in Tights, Dracula, Lady Jane, The Crush, Twister, Liar, Liar and many more. Cary is hitting the road to give fans the once-in-a-lifetime chance to capture this piece of cinematic history. 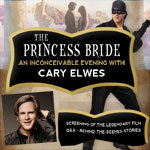 Don’t be a Humperdinck, make haste to see The Princess Bride: An Inconceivable Evening with Cary Elwes for a night you will always tweasure. Tickets start at $39. A limited number of VIP packages are available and include the best seats in the house, a Meet and Greet with Cary Elwes, and a signed copy of Cary Elwes best-selling book, As You Wish: Inconceivable Tales from the Making of The Princess Bride.